30th July 2017, 1:30pm with slight overcast skies and tide receding. Disappointed that only a few pieces of seaglass were deposited after the strong storm that we had had the previous day. At least I was able to find this decent chunk along with some other white, clear, brown and light aqua pieces. Since the council down there have dumped a lot of rock onto the foreshore, the tidal deposits have diminished. Making it harder to find a decent cache these days. It's still a good place to drop down to on the off chance. Used a Sony Cybershot 16.1 mega pixels camera, set on automatic. 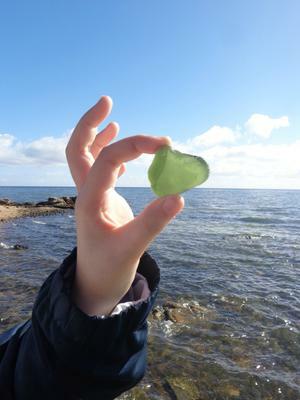 We like the setting as well as the sea glass. Also the description.